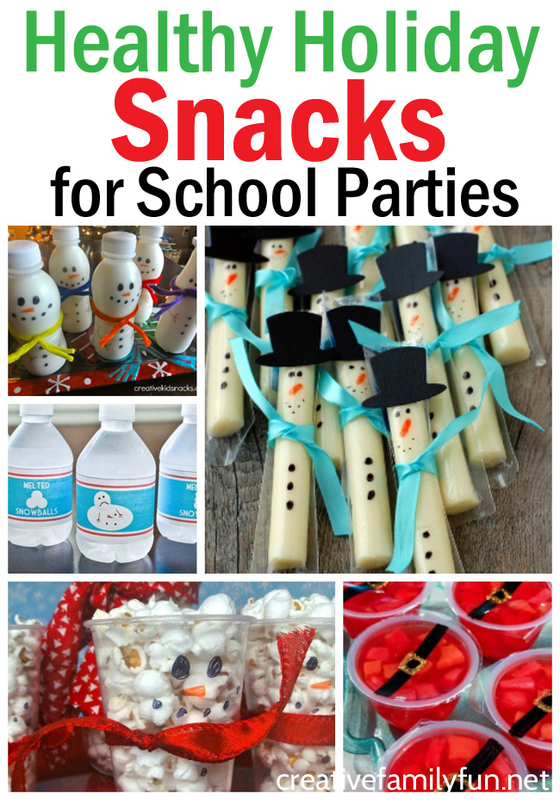 There are a lot of challenges when it comes to planning a school party. One challenge is that you can only use store-bought treats. And it’s not always easy to combine store-bought and healthy. 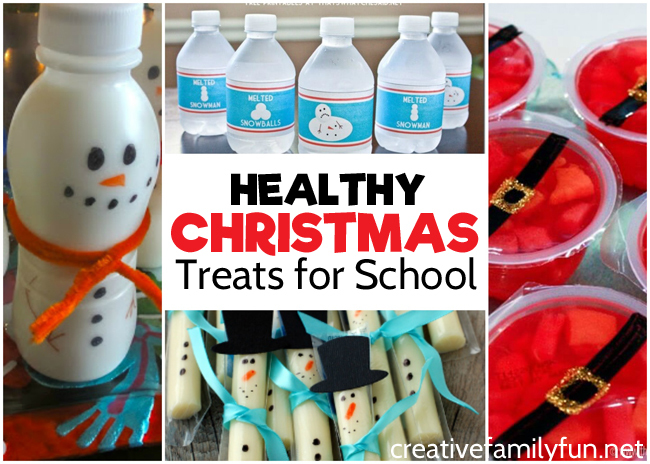 Luckily, with just a bit of crafty ingenuity, you can bring in some fun and healthy Christmas treats for school that the kids will love. Turn packaged string cheese into cute String Cheese Snowmen like this fun idea from No Biggie. You can transform an applesauce cup into a fun holiday treat when you make these Rudolph applesauce cups from The Melrose Family. Or you can make another Rudolph treat when you turn little oranges into these healthy reindeer treats from Hello Splendid. Provide the kids with a healthy drink of milk when you create these fun Snowman Milk Chugs from Creative Kid Snacks. These free Melted Snowman Water Bottle Labels from That’s What Che Said will turn simple water into a fun holiday treat. Let the kids fill these fun Snowman Popcorn Cups from Creative Kid Snacks from bags of store-bought popcorn. Or, the kids can use a store-bought veggie tray to fill these cute Vegetable Christmas Party Cups from My Mommy Style. Use a few simple decorations to turn Babybel Cheese into cute Santa Bellies like this idea from Cute Food for Kids. It’s easy to turn fruit cups into cute snowman faces with this idea from Bren Did. Or you can use those fruit cups to make cute Fruit Cup Santa Snacks like this idea from That’s What Che Said. 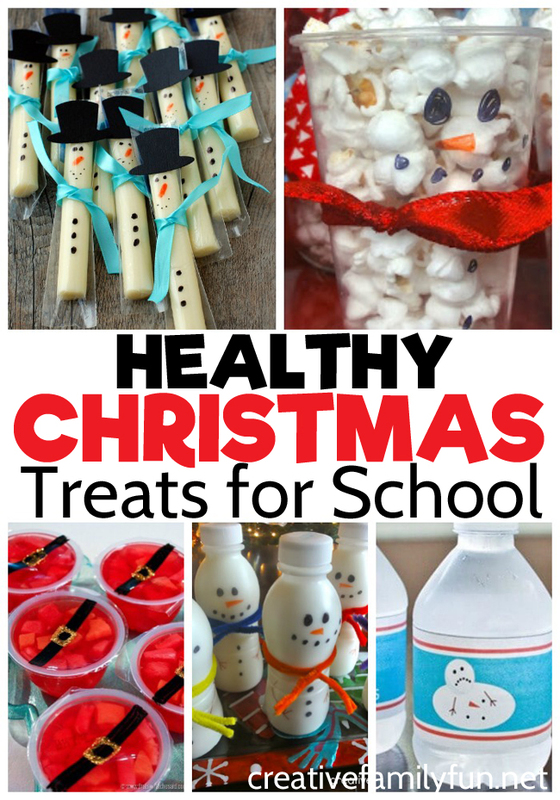 Any of these fun healthy Christmas treats for school would be a great hit in the classroom. Plus, you’ll feel better because you’re not feeding the kids endless amounts of sugar. There’s got to be balance, right? With just a little bit of creativity, you can make any healthy snack festive. If you’re short on time, here are some great holiday bags and containers to put your healthy Christmas treats for school.